Challenges Of Digital Marketing | Business Article | MBA Skool-Study.Learn.Share. Digital Marketing is a growing field across sectors today. While it comes with a plethora of opportunities, there are also challenges that must be overcome in order to fully harness the capabilities of this opportunity. The article talks of some of the most prominent challenges that businesses today face when they align their business strategy (more specifically, their marketing strategy) with digital marketing. While most people today talk of how digital marketing is defining businesses and creating new opportunities, in this article the author tries to bring to light some of the challenges of digital marketing. The idea is not to discourage digital marketing but to be aware of its pitfalls. 9 out of 10 of them (86%) use social media sites. Internet penetration is evolving year-on-year and clearly digital marketing has a huge potential in India. While, this presents huge business potential for the businesses, they need to be aware of the challenges of digital marketing so as to take more informed decisions. Lets talk about the forms of digital marketing now. There are mainly two categories of digital marketing, namely the push marketing and pull marketing. In pull marketing, the onus is on the customer to explore different available products/services. In push marketing, the business houses push their products to the customer. The biggest challenge lies in identifying the channel(s) which fit your business requirements. While each channel has its own reach,advantages and richness, there are associated costs with each of them. Every business has a fixed marketing budget and thus need to invest wisely so as to maximize its returns. The problem is how to choose. No one wants to miss the bus. Specially with the emerging social media marketing, companies are not sure which one would work for their business at the optimal cost. Most companies are reactive rather than proactive in choosing the channel for their business. They choose a channel because others in the industry are doing so, without seeing inside their own business model. What is required is an inside-out approach where the business leaders identify what are their objectives and which channel fits best with respect to these objectives. Unfortunately, businesses today are falling into the trap of doing the reverse. They select a channel and then see how it can meet their objective. Its not just the choice of channel which is challenging, but also different channels need to be chosen at different times, depending on the changing market dynamics. The frequency of the messages is critical. Too many messages may bug the customer, too less may not capture his attention. Next associated challenge is the capability of digital marketing to break your business. Thanks to things going digital, it takes minutes for a bad word to spread. And before you know, you are out of business. Here, the author would refer to the case study on Dell, popularly called “the Dell-Hell”. Dell received complaints from one of its customer, but did not attend to it satisfactorily. The frustrated customer, “Blogger Jeff Jarvis” started a series of blogs, popularly called the “Dell-Hell” and within days many more agitated customers joined in, the sales dropped and Dell lost crucial points on few of the industry’s crucial customer satisfaction surveys. Thus, while companies create many avenues of customer interactions, sometimes Customer-to-Business and lately, Customer-to-Customer, they need to understand that the product quality, customer support become all the more important as one wrong word can break your business. Even more worrisome is the point that your competitors may get into unethical practices and malign your business. This is more so in developing countries where the regulatory laws are not strong. Another challenge of digital marketing is the pace at which it is evolving. Few years ago, companies used to do make 5 year plans on their marketing strategies. Not any more can they do so. What is “hot” one year is out-of-date the other. 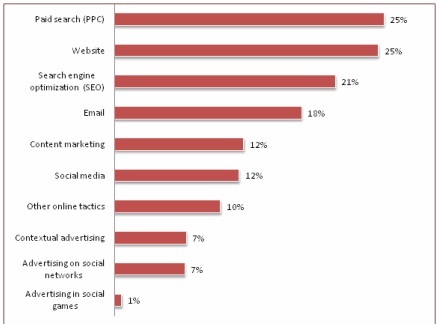 Companies are in a fix and do not know how to strategically plan their investments in digital marketing. We must not forget that investing in channels like mobile application development, etc incur huge costs and the companies need to really reap the benefits of developing these quickly, before the technology fades and newer technology emerges. We cannot get up one fine morning and think of going online. Many banks are still in a fix on whether to develop mobile applications, how much complexity to add on these applications and what all platforms to cater to. It takes a lot of money, infrastructure to get into digital marketing space. Add to that the cost of maintaining the older channels, and businesses are in a fix. Businesses must not just be agile to evaluate and adopt new digital marketing opportunities, but also smart enough to abandon the older ones. Maintaining older channels, even though they are not longer generating business kills the revenue stream for many businesses. There are no perfect metrics to evaluate the effectiveness of digital marketing. How do you measure the ROI of any channel? Are there any standards? There are no set answers for these questions. So, while businesses are aware of the need to spend on digital avenues, they are not aware of how to measure which channel works best for their industry, for their business. Thus it is really a subjective judgement made by business houses and may not be perfect. Analytics is working on developing sophisticated tools for measuring the effectiveness of the digital marketing and hopefully should throw some light for the business houses. One must remember that going digital does not translate into completely doing away with brick and mortar stores. First of all, not all things can be sold online. While most businesses can use digital marketing for creating brand awareness, this does not necessarily translate into sales. We cannot expect people to buy high value items online. At the same time, people still like to feel certain products before purchasing. While customers may make buying decision online, they still prefer to go to a physical store to buy. Thus digital marketing cost is over and above the usual costs incurred and do not act as substitute. Businesses need to maintain both the traditional and digital channels of marketing and sales and this is additional cost. Digital Marketing has low entry barriers. Businesses based on e-commerce are seen as low entry barrier setups. But, what is low entry for one person is also low entry for the other. This effectively means that competition is more fierce for digital based businesses. Customer loyalty is low online. Since customers do not have any personal interaction with the sellers, the switching rate is much higher for digital businesses compared to the traditional businesses. Businesses need to align their digital marketing efforts with the traditional ones. These too should complement rather than canibalize each other. Simply marketing through a plethora of channels would not serve the purpose. Businesses need to structure their marketing campaigns to reap the maximum benefits. Customer expectations are at all time high. They need and appreciate customized products, customized buying recommendations, personalized attention even digitally. This has to be done at the right frequency. Digital marketing can result in internal process re-oganization need. As the reach of digital marketing, businesses find out that their current processes and database models are not designed to support the new needs of the businesses. Thus, a fundamental reorganization of internal processes and systems is called for. These requirements can be a huge cost and result in severe downtimes and thus need to be handled with a good amount of discretion and after evaluation. Line between innovation and adoption is thinning. In the race to match the external business environment, business focus should not shift away from innovation. Businesses need to mature enough to decide what works best for them rather than just do what others are doing in the space of digital marketing. Customers look for differentiation both in products and the way the products are marketed. Compromising one for the other will ultimately lead to loss of business. To conclude, while digital marketing is necessary and literally, no business survives without it, it incurs huge cost, changes everyday and presents the problem of plenty. Marketers need to be prompt to identify what would work for them in the short run as well as in the long run, and work in tandem with the other organization functions to effectively use the channel of digital marketing. No doubt, the digital marketing is here to stay. The challenges if overcome will help each business to differentiate and grow as a leader in its industry. This article has been authored by Disha Chhabra from IIM Kolkata.